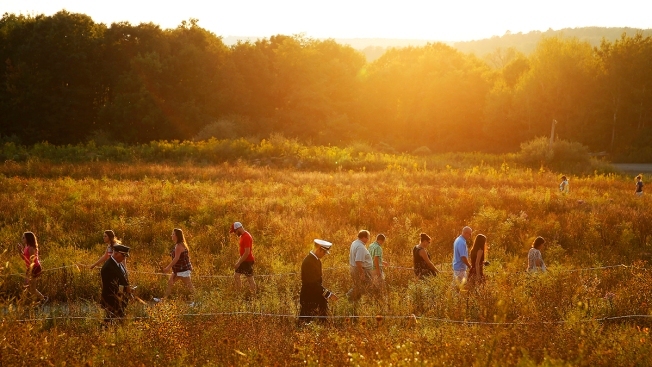 In this Sept. 10, 2016, file photo, visitors make their way through the Flight 93 National Memorial in Shanksville, Pa. The remaining wreckage of United Flight 93 will be returned later this year to the memorial marking where it crashed in the 9/11 terrorist attacks, officias said June 1, 2018. Officials say the remaining wreckage of United Flight 93 will be returned later this year to the Pennsylvania memorial marking where it crashed in the 9/11 terrorist attacks. Flight 93 National Memorial Superintendent Stephen Clark says the wreckage will be buried in a restricted area of the Shanksville park that's accessible only to loved ones of the victims. President of the Families of Flight 93 Gordon Felt says his group requested a final search of the debris to see if there were any human remains or personal items in the wreckage. Clark says workers found a number of items that will be added to the memorial collection, including an orange passenger call button. The National Park Service will release a full report of the items collected later this year.